The Knickerbocker Hotel in Linesville, PA has quite a history, including paranormal events that have been documented many times over. Originally built as the Arnold House in 1882, M.A. Arnold opened this building as a new hotel in the area. In 1885, only three years after completion, Clara Arnold, the wife of M.A. Arnold, died of tuberculosis, reportedly in an upstairs bedroom. The Arnold family were the hotel keepers and probably lived in the hotel during that time. It's also reported that one of their children also died in the hotel. Paranormal activity seems to be active in Clara's bedroom and one of the children's bedroom, although many other things have happened throughout the entire hotel also. Goosebumps Paranormal Society had flashlight activity in Clara's room, where we asked questions and the flashlight would turn on and off as a direct result of questioning. In the third floor front bedroom, Jimmy and Dee were witness to the sound of footsteps walking on the wood floor passing between where they were sitting. In one of the children's room, we had a lot of EMF activity in which the detector would blink ten times and stop, then ten times and stop...and continue with this sequence for nearly an hour. During this sequence, the flashlight turned on and off with the EMF detector. We also have video of a prominent orb dancing across the room when no other orbs ever came into view. We were fortunate to capture quite a bit of activity during our evening investigation. The Knickerbocker Hotel in Linesville, PA...make sure to put this one on your list of places to visit! Although vacant for nearly twenty years, this remarkable Victorian style home was built in 1883 and has some pretty interesting rumors of paranormal activity. Owned by at least two families over the years, it finally became a nursing home before being abandoned and neglected. Goosebumps Paranormal Society was able to track down the owner and secure permission to investigate this incredible building. Being a nursing home for years, many people passed away in this house and some say they have never left. Rumors are that when the house was being renovated long after the nursing home closed, tools would fly across the room on their own, scaring the workers into never returning. Sitting vacant for twenty years, weather took its toll and the roof partially collapsed causing extreme damage to the interior. After all this time, it is currently being renovated once again. Goosebumps investigated the house and gathered some interesting evidence that paranormal activity is still present. We did a "live" broadcast of the investigation on our Facebook page so the viewing audience could see how an investigation takes place and see any activity as we see it, when we see it. Needless to say, the audience was not disappointed. We like using a mini-mag flashlight to help communicate with spirits, among numerous technical pieces of equipment. We set the flashlight in a location and ask, "Is there anyone here that wants to make yourself known to us, please turn on the flashlight." Sometimes you get a response, many times you don't. The flashlight remained inactive throughout most of the investigation, until we said we were ready to leave. At that time, the flashlight turned on. It continued to turn on and off at our command with asking questions. You can view the videos of our investigation on our Facebook page, the flashlight activity is on "Nursing Home - 3rd live video." Just scroll down the Facebook page until you come to it. We also set up a digital video camera in a third floor bedroom. This camera had a full battery charge that would run the camera for hours, along with a media card that would record hours of video. When we checked the camera's video after the investigation, at the 1:35 mark, which is one hour and thirty-five minutes into the recording, the camera went blurry and stayed out of focus, then forty-five seconds later...the camera shut off completely. There was no reason for this to happen. The battery still showed almost a full charge, the media card had hours of space left to record. The room was lit with enough light for the camera to stay focused, yet the camera went blurry and then shut down. Nobody was on the third floor, all members were accounted for in other areas of the house. We could not come up with an explanation why this happened. Paranormal? Maybe. The owner says he has not experienced any odd occurrences while he's been there renovating recently, and if there were any he doesn't mind sharing the house with them, as long as they behave themselves. Check out the live investigation videos on the Goosebumps Paranormal Society Facebook page. You will be entertained. Jimmy and Dee with the cast of Animal Planet's "Finding Bigfoot"
Matt Moneymaker, Dee Trick, Cliff Barackman, Jimmy Trick, Bobo Fay. ﻿ Goosebumps Paranormal Society had the honor of being asked to film an episode with the cast and crew of Animal Planet's "Finding Bigfoot" TV show. The episode, entitled 'Paranormal Squatchtivity,' can be seen on the season finale of Season 6 - Episode 7. In mid-August 2014, the crew came to Uniontown, PA to film the parallels between paranormal activity and Bigfoot sightings. It seems that where Bigfoot sightings have been reported in southwestern Pennsylvania, there have also been many paranormal reports in the same areas. The producers wanted to see if there was a connection and contacted our own GPS member David Dragosin, Director of the Pennsylvania Bigfoot Society - Western Sector, and asked if he could assist with documented Bigfoot sighting locations and provide a good paranormal group to help them investigate. They obviously asked the right guy. Dee, Jimmy and David met with the show's producers and everyone clicked immediately. They decided Goosebumps Paranormal Society was the group they were looking for. Dee and Jimmy later met with Cliff Barackman, one of the show's stars, along with the entire production crew one night at Jumonville Glen, located along Chestnut Ridge southeast of Uniontown. Caution needed to be exercised walking through the dark woods at night because a local man told us there had been a large black bear seen many times in the area over the past two weeks. There have also been numerous Bigfoot reports in and around this area, but the paranormal activity reported has been phenomenal. Jumonville Glen is the location where young military officer George Washington and his army ambushed the French in 1754, prompting the start of the French and Indian War. Documented paranormal activity includes the sounds of musket fire, French-speaking voices being heard, yelling from soldiers, Native-American Indian voices, apparitions of period-dressed soldiers being seen along with unexplained battle sounds. Our objective was to set up our investigative equipment and film at the exact location where this battle took place. And this we did...in the middle of the night, in the deep woods, and to our surprise...during an intense thunderstorm. After hiking down a long, dark trail to Washington Rocks, pictured here at the left, the actual site of the bloody battle, we set up our equipment in complete darkness, which consisted of video recorders, audio recorders, EMF detectors, an EMF pump generator to produce energy for spirit manifestation, laser grids and flashlights. The flashlights were used as communication devices to possible spirit activity. We asked questions and hoped that the spirits would turn on the flashlight in response to show us they were here. Cliff was new to this method and thought it was fascinating...if it worked. We had two TV cameramen, two sound men and one of the show's producers with us and they filmed continuously during the investigation. The questioning was started by Dee and Jimmy, prompting Cliff to do the same, which he did. Nothing happened for more than forty-five minutes except lightning, thunder and rain. The equipment was getting wet and it appeared it was going to be a bust investigation in such a rich paranormal area. Cliff asked what kinds of things have been caught on recorders to show paranormal activity. Jimmy explained a few instances from the Gettysburg investigation with voices and gunshots being heard on the audio recorders when nobody was around to account for it. Dee expressed her excitement about the flashlight turning on and off on a few other investigations during direct questioning. Cliff asked, "So it's kind of like Bigfooting, it's the little things that keep you coming back for more?" The flashlight suddenly turned on and then went off as if someone was saying yes. Everyone was excited and more questioning pursued, but with no immediate responses. Since this show was really about Bigfoot anyway, we started asking Bigfoot questions until Dee finally inquired, "Do you know Bigfoot?" The flashlight turned on again, the entire crew surprised, then Jimmy asked, "Are you going to turn it off now?" The light went off. That was the extent of the paranormal investigation because of time needed for the next segment of the episode. Cliff said it was now time to introduce us to Bigfooting. He schooled us on things to look for, tracking, tree knocks and the art of whoop calls. Having never done a Bigfoot call before, Cliff said we did pretty good. At one point, Cliff told Dee that they were going to leave her alone in the woods because Bigfoots like women's voices. He said, "With a little luck you'll get mauled by a Bigfoot tonight." Dee's response was, "Oh boy...we can only hope." A lot of what we filmed was not put on the show, I'm sure because of time needed for the other segments that were filmed with the other stars. But the exposure for GPS, Dee and I has been fantastic. Not only nationwide, but international too. People have contacted me from London, Belgium, Australia, India, Brazil, New Zealand...literally all over the world, who saw the episode and "Liked" our Facebook page. We're honored to be a part of Animal Planet and "Finding Bigfoot." Though Bigfoot was not found that evening, the entire experience with the "Finding Bigfoot" cast and crew was unbelievable. The production crew of seventeen people were extremely professional and astute, but all were fun and joking with us the whole time. The cast...Matt, Cliff, Ranae and Bobo were great to be with and enjoyed our paranormal take on the episode. Special thanks to Sean Mantooth, producer, (though Sean kept drilling into our heads...Hollywood Producer) and Ryan Golembeske, associate producer, who we originally met with that cleared the way for GPS to be on the show...we really love you guys and miss having you around. Check it out...Animal Planet, "Finding Bigfoot", Season 6 - Episode 7. Squatchy! A couple in Southwest Pennsylvania contacted Goosebumps Paranormal Society after being concerned with hearing voices, seeing shadows, losing much sleep and feeling more and more uncomfortable in their home built back around 1840. Her parents purchased this home in 1959 and after their passing she still lives in the house today. Their large dog has recently been spooked by something and would not go upstairs anymore and they have been sleeping in their living room because it became too spooky and stressful upstairs in the bedroom. After an extensive client interview process, GPS went to work with two separate investigations taking place on consecutive weekends. Although we recorded extensive hours of video, review of these tapes revealed nothing. But our audio recorders said otherwise. We analyzed these recordings and isolated fifteen different instances of direct responses to our questions, including voices answering us, knocks under a table where we all were sitting and other noises that we just could not explain as being normal sounds in a house. One question we asked was, "Are you a woman?" The direct response was a man's voice saying, "No." Another question was asked in one of the bedrooms, "Do you still feel that this is your home?" A woman's voice answered, "Yeah...I do." The client stated that when she was a child, her mother used to make Snickerdoodle cookies and recently on several occasions she could smell the cookies baking in the kitchen, indicating her mom's energy could still be present in the home. An EMF detector was placed on the kitchen table and during this conversation it was constantly peaking with a high energy reading, yet prior to this it remained quiet. Also when the cookies were mentioned, a young girl's voice was picked up on an audio recorder saying, "I'll have one." Further analysis of the recordings revealed a whoop sound in the back bedroom, several knocks of different intensity, a deep growl and other voices recorded in response to our questions. 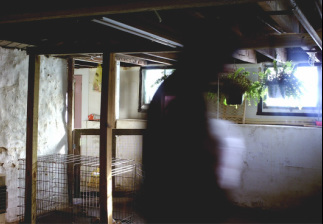 The picture shown above indicates what appears to be a shadow figure that was taken in their basement with a trail camera, the same type used by hunters when they want to see deer activity in the woods. Although nobody was home at the time, the camera sensed motion and then snapped the picture. We've run this photo through extensive photo editing software, adding and subtracting filters and lighting, but all we came up with was a dark, shadowy figure. We cannot get any defined lines or detail on the subject. I even contacted another well known paranormal group and asked them to run it through their software - their conclusion was the same. In fact they said it made them feel a little creepy and it could be a great piece of rare evidence. As a result of this finding, GPS decided to invite a priest to come to the home and perform a cleansing and blessing. We walked through the house with him while he went room to room guided by the homeowners, praying and sprinkling Holy water throughout. Afterward he presented the clients with a cross that he blessed and left them the balance of the Holy water. Goosebumps Paranormal Society followed up with a visit to the client's home a few days later to see how things were going. Entering the home immediately revealed something spectacular...the clients were happy, smiling and a complete change had taken place. They were no longer hearing voices, no longer seeing shadows, the air felt lighter without that unknown heaviness about it, their dog was not frightened anymore and for the first time in two months...they slept upstairs in the bedroom and were comfortable. GPS was honored to be able to help these people get their home back and will continue to stay in contact with them to offer assistance and support. A man in Swartz Creek, MI contacted us with a concern about seeing strange lights and electrical streaks in his yard at night. The client walked us through his entire 2 acre site and showed us where he saw these strange lights. GPS did a complete 3 hour investigation and at the conclusion the client found the camera's media card and showed us the pictures he took with his digital camera. He told us what he witnessed was only on the photos he took at night, not with the naked eye. We immediately determined the client was taking pictures in his yard at night with the camera's shutter exposure set on a long exposure. This will create the image of swirls of light from any light source in the camera's view if the camera is not perfectly still, or in this case the camera was still but the light sources themselves were moving, as you can see in the photo at left that we recreated to simulate what the client what seeing. The light sources he saw on his digital photos were actually fireflies leaving a trail of colored light with the long exposure. No paranormal activity was present, just a miscalculation by the client on the camera's settings. The homeowner has reported no other unexplainable circumstances since that time. This particular case took place in Eastpointe, MI. The family was having strange things happen in their home, hearing footsteps, whispers, shadows, voices during the night and worst of all - scratches on the client's arm as shown in the photo that appeared one evening while she was lying in bed watching television. She claimed to be lying under the covers when she suddenly felt a burning sensation on her forearm. Pulling the covers back she discovered a host of scratches on her arm that were becoming more inflamed by the minute. The client knew it was time for help. Goosebumps Paranormal Society went to work doing a full research of family history, discovering that similar happenings occurred at their previous dwelling a few years before. She informed us that a house blessing was performed at that time and things ceased. When they later moved to this new location things slowly started to reoccur once again. A classic poltergeist haunting was determined by the GPS investigative group, being that a poltergeist often attaches itself to a certain person instead of a place and may travel with that person wherever he or she may go. A complete blessing of the new home was strongly recommended. The homeowners on this case in Ortonville, MI contacted GPS with a number of concerns and unexplainable things happening in their home. Voices were being heard, shadow figures seen, their young child seemingly would be carrying on a conversation with someone and nobody would be there, even their cats would follow unseen things in a room with their eyes and sometimes get spooked and run off. The most concerning was when the wife was slapped on her backside, leaving a red handprint, and nobody was near her at the time of the incident. The photo at left was taken by our investigative team and shows a partial shadow on the left side of the frame. Even though this shadow appeared only once in a long series of time lapse photos, after much investigation it was determined by our team that it was "explainable" as there was slight team member activity in the room at the time. It wasn't until the team analyzed the isolated audio files corresponding to this event that the result was found, something that could have been easily overlooked and determined otherwise. GPS is dedicated to getting the correct results for our clients. Also during the investigation the team took many audio recordings in each room. There were a number of unexplainable EVP's, or Electronic Voice Phenomenon, including heavy breaths and voices not consistent with the ambient room noise that were picked up on the audio recorders. In the final analysis, paranormal activity could not be ruled out. A thorough investigation by GPS team members did find some possible answers for a few things, such as power lines and wiring in certain areas of the home giving off high Electromagnetic Field readings in locations of concern. This can create the possible feelings of dread, nausea, headaches, uneasiness or even feelings of paranoia and being watched. GPS suggested a few remedies to correct some issues, however a complete room to room blessing and cleansing ritual was advised and performed by the team. Since that time, the heaviness in the home has been lifted and the homeowner has reported no further activity. In the fall of 2010, GPS Founder Jimmy Trick took a trip to Gettysburg, PA to do a little investigation on his own. Numerous reports of voices, apparitions and battle sounds have been documented since the Civil War Gettysburg battle ended in July of 1863. Gettysburg is known as the most haunted place in America and Jimmy wanted first-hand experience of these reports. One of the fiercest battle locations took place in what is known as the Triangular Field, located between Devil's Den and the Wheatfield. This intense battle exploded on July 2nd, 1863. Jimmy walked the large open field with nothing more than a digital audio recorder, asking questions and recording as he walked. The closest people in the vicinity were at least a hundred yards away. Getting no known responses to his questioning after making the complete loop around the battlefield, he decided to play back the recording for analysis. To his surprise, during most of his walk, he heard several men's voices carrying on conversations that sounded like they were right next to him, yet he heard nothing while walking the field and came across no one during his walk. He couldn't make out most of the actual words, but the voices were definitely there. Jimmy was definitely convinced that some of the energies still remained from that horrific battle and paranormal activity was indeed present. The Triangular Field is only one area where people have reported hearing and even seeing images from the Civil War. Some have seen soldiers dressed in period clothing walking through a field, only to disappear from sight in front of their eyes. Others continuously hear gunfire, cannons booming and even smell gun powder when nothing is visually present. Another area Jimmy investigated was near Spangler's Spring, a natural well where the soldiers of both sides would gather at different times to collect water. Jimmy left an audio recorder running on a rock nearby and came back to check it thirty minutes later. At one point on the tape you can hear six loud gunshots within a span of eight seconds, spaced differently apart, the definite sound of rifle fire nearby, yet Jimmy heard nothing during the thirty minutes he was there. These sounds were only heard on the audio playback - more evidence of energies still lingering after a traumatic battle. If you're a paranormal investigator, or just interested in trying to find some strange and unexplainable experiences, then this is a must-see place to visit. You can walk and explore the battlefields, stay the night in a haunted hotel or Bed and Breakfast, even tag along on a haunted tour. Gettysburg...the most haunted place in America. It's calling you. When walking through a local cemetery one morning carrying only an audio recorder, Jimmy had the recorder running while wandering around the headstones and continually asking questions along the way. The cemetery was small, about two acres, and the posted name was from a family that settled in that area in the mid 1800's. It rested along a dirt road and there were no houses or buildings nearby, only open farm fields, totally secluded. His walk covered the entire small cemetery, graves since the Civil War, and the walk lasted nearly twenty minutes. At one point just over fourteen minutes into the walk, Jimmy asked a specific question. The question was this: "Is there anyone here...that hasn't crossed over...that's still wandering around the cemetery for an unknown reason...is there any way I can help you...if you are?" Of course Jimmy heard nothing while walking, no cars, no neighbors or dogs, no birds, no voices. When he returned home and analyzed the recording, something really caught his attention just beyond that fourteen minute mark. Remember the question..."Is there anyone here...that hasn't crossed over...that's still wandering around the cemetery for an unknown reason...is there any way I can help you...if you are?" Exactly four seconds after Jimmy asked that question, a distinctly clear woman's voice said in a matter-of-fact way, "No." Jimmy played the recording for many friends and fellow investigators, everyone trying to come up with an explanation...but there were none. In the end, all concurred the exact same thing: it was definitely a woman saying "No." It seemed to be pretty good evidence of paranormal activity in a cemetery when clearly there wasn't anyone or anything anywhere around to account for that sound. The Cashtown Inn near Gettysburg is known to be a paranormal hot spot with many things that have been documented over the years. On June 29th, 1863, this hotel served as the headquarters for Confederate Lt. General A.P. Hill and the Third Corps during the Battle of Gettysburg. A stable next to the Inn, which no longer stands, served as a hospital for the wounded soldiers during the battle that took place just eight miles away. Patrons that stay at the Inn have reported hearing footsteps during the night, a rocking chair moving, a picture frame sliding on the table, voices, sounds of horses and carriages travelling the Old Chambersburg Pike Rd. out front during the night, even the sound of cannon fire along with many other unexplainable things. The T.V. program “Ghost Hunters” did an episode on The Cashtown Inn, and this is what caught the attention of Goosebumps Paranormal Society. GPS team members stayed at the Inn for two consecutive nights. Jimmy stayed in the same room that Lt. General A.P. Hill acquired during the three day battle. It’s also the room that showed the most activity during the “Ghost Hunters” episode. During the two night investigation by GPS, there was very little activity…except at about 2:30am the first night. Jimmy was asleep in bed and left an audio recorder running on the nightstand to record any possible EVP’s, or electronic voice phenomenon, during the night. He was lying on his stomach with his right arm up over his head when suddenly he was awakened from a sound sleep with his arm shaking violently, not from a twitch or a spasm, but like someone had a hold of his forearm and was shaking it in a way to get his attention or wake him up. The second Jimmy opened his eyes the shaking stopped. He quickly played back the audio recorder thinking maybe he was dreaming of the event and during playback he could hear the entire bed rattling during that moment indicating it was no dream, yet no one was there. Another team member, Dee, also reported the same night that she heard what sounded like a woman moaning a couple of times in her room, and it was picked up on the audio recorder but there was no explanation for it. Team analysis verified the sounds of a moaning woman. Even though no other evidence was captured during this investigation, GPS will definitely be going back to The Cashtown Inn for further investigations. About two years after the Cashtown Inn investigation, Jimmy was speaking with an historian about the incident of his arm being grabbed and shaken. The historian just looked at him and smiled, then he asked Jimmy if he knew the story behind that whole incident. Being confused, Jimmy said no. The historian continued by saying that General A.P. Hill had a young assistant, a teenage boy that took care of the General's military affairs when needed. The night before the Battle of Gettysburg began, the General was asleep and needed to be awakened due to a situation that needed immediate attention. The young assistant entered the General's room, grasped the General's forearm and shook it vigorously to awaken him. Make your next visit to Gettysburg an overnight stay at the Cashtown Inn. You just might be awakened from your sleep. This particular client near Pittsburgh has reported many things happening over the years. The recent passing of his mother in the home has triggered even more events. The client lives alone but has been awakened at night to the sound of creaking floorboards in the hallway outside of his bedroom like someone was walking around, only to find nothing there. There have also been footsteps and banging noises coming from the attic directly above his room and a shadow figure has been seen by another family member a couple of times in different areas of the home. He contacted Goosebumps Paranormal Society for help. GPS went to work. The team set up video cameras, motion sensors and audio recorders in the attic and hallway where the noises were reported. Other team members did a room to room recording session of asking questions and hopefully getting some answers through EVP's, or electronic voice phenomenon. One particular room appeared to be very active - the bedroom where his mother passed away. Using only an audio recorder, an EMF detector and a Ghost Box that uses white noise to generate electromagnetic energy into spoken words, two team members asked questions while in the room. It wasn't long before the EMF detector showed electromagnetic field activity indicating something was going on in the room with them. When a team member asked a "yes" or "no" question, the meter lit up each time showing a direct response to each question. This continued with almost every question asked and they seemed to be carrying on quite a conversation. An apparent spirit named "Bob", who revealed his name through investigative equipment, was communicating with them and enjoyed their company because when they periodically asked "Do you want us to stay Bob?" the meter would light up. The entire conversation lasted about twenty minutes. After the investigation, GPS had a meeting with the client and told him of the conversation with "Bob". The client stated he had a close relative with that name that passed away many years ago. Coincidence? I don't think so, especially since the team didn't know of any family members named Bob prior to the investigation. Further analysis of all the audio and video taken from the attic where footsteps and banging were reported turned up no other evidence. It didn't mean that there was no activity in the attic, just that there was no activity during the short time we were there investigating. The client is eager for us to continue with another investigation and GPS is happy to do so. Goosebumps Paranormal Society had the opportunity to investigate the Hill View Manor in New Castle, PA. This three story building was used as a nursing home and later an asylum from the years 1926 to 2004. The property manager has kept the building open to investigations by appointment only. Since its closing, many people have reported quite a number of strange things happening, including voices being heard, apparitions seen, doors opening and closing, a piano playing and voices heard on audio recorders. It was featured on the TV shows "Ghost Adventures", "Ghost Lab" and "Ghost Hunters" and each one of the programs experienced unexplainable things. We at GPS had to find out for ourselves. The entire building was open to GPS from 8pm to 5am and a tour was given before we began our investigation to show the areas of most activity. Dee and Jimmy started on the third floor while others were scattered throughout the other floors and wings. The building is unheated, dark and quite cold in December. They picked a large room, possibly an activity room of some sort to start their investigation. The room was empty except for two small organs and two chairs. Jimmy placed a mini-mag flashlight standing upright on the floor in the middle of the room and they sat in the chairs against the wall. Dee was holding an EMF detector while Jimmy held an audio recorder. They then began to ask questions and asked if anyone was in the room and if they were, could they turn on the flashlight. At first nothing happened, but a few minutes later the flashlight came on after a question was asked and then went off. Jimmy asked a question again and the light came on. He asked another and the light went off. Also during the session the EMF detector that Dee was holding was periodically lighting up and showing quite a bit of electromagnetic activity, only after we asked questions showing a response. This was direct communication with a spirit in the room with them. The session lasted about half-an-hour with incredible results. The same happened in two other areas of the building, not only with them but with other investigators. Jimmy and Dee teamed up with three others on another floor and the same thing happened there, all were witness to it. At the end of that session, the flashlight remained on and Jimmy ended the session by picking up the lit flashlight. He then asked, "Can you turn off the light while I'm holding it?" The light immediately turned off. Although we did not find any other evidence on our audio and video equipment, we've determined that this place is definitely active with paranormal activity. GPS has already scheduled a return visit to further investigate more of the Hill View Manor. The new owners of a local Pittsburgh tavern contacted GPS because of unexplained activity taking place inside the building. This activity has been going on for quite some time, years before the new owners took possession. The building is a two story structure with a dining room, kitchen and bar on the first level and a large party room and offices upstairs. Reports consist of sounds of sliding furniture coming from the upstairs party room when no one is there, voices being heard, a woman in a white dress appearing in the upstairs window and also walking down the stairs and disappearing into the dining room and bottles occasionally flying off the bar with nobody nearby. Also the owner has reported that she feels she's being watched in her office and gets headaches often while being there. Lately a few times the dining room motion sensor was triggered and set off the alarm about 3am after the building was long closed, prompting the local police to arrive with the owners to find nothing wrong. The police also told the new owners that they have a history of being called there because of strange reports and have never found anything. A general EMF sweep (electromagnetic field) of the upstairs found extremely high readings throughout, especially in the owner's office, indicating something was producing very high electromagnetic fields. Computers, TV's and electronic equipment all give off EMF's, but these readings were far from ordinary. Further investigation discovered high voltage wires entering the building just outside the office window accounting for much of the high readings. It also may be the reason the owner had feelings of being watched and experienced headaches, as high EMF readings can give you feelings of paranoia, uneasiness, nausea and headaches. It was suggested to the owner that they invest in a portable EMF neutralizer which just plugs into any convenience outlet, found in most home improvement stores. But the investigation in the party room had much of us thinking. Although no evidence or EVP's (electronic voice phenomenon) were recorded by our audio and video equipment, a simple mini-Maglite flashlight seemed to be our connection to someone in the room. The setup is this...adjust the on-off twist bezel to the point in between on and off. Stand the flashlight upright on a sturdy surface and ask yes or no questions to any spirit that might be present. If you get flashlight activity it is believed you just might be connecting with the paranormal. We had some activity, but it took almost forty-five minutes before it started, so there is no consistency to the flashlight turning on and off on its own as some people believe. And then it was sporadic and ongoing. The owner was with GPS members in the room during the activity to witness the results. With no activity for nearly an hour, something finally happened. After asking, "Is there anyone here with us...could you turn the flashlight on?" It finally came on...then after a few seconds turned off. About ten minutes went by before it happened again with the question, "Is there anybody here that you don't like...that makes you feel uncomfortable?" The light turned on again...seconds later it went off. Jimmy asked, "If I'm the one that makes you feel uncomfortable...turn the light on." The light immediately turned on very bright...then went off again, but further questioning revealed that it was okay for Jimmy to stay. After a few more minutes of no activity, one of our guests asked, "We're going to leave now, can you say goodbye by turning the light on?" The flashlight immediately turned on and then went out. No further substantial activity was detected the rest of the evening, however GPS will be doing another investigation in the future to try to determine the root cause of their continued activity.